Improves the aging face by correcting sagging jowls, neck and cheek folds creating a more youthful rested appearance. - Breast Soft Tissue Reconstruction after Tumor Surgery. Rhytidectomy means to remove wrinkles surgically. The aim is to make the patient's face look younger. Excess facial skin is removed without tightening underlying tissue - the skin is then re-draped on the patient's face and/or neck. Appearance of Wrinkles over face with time is a natural process. If you do not like them, a facelift may be a answer for you. Technically this is known as rhytidectomy, or tightening of skin with or without tightening of superficial facia (SMAS) of face. Cost Estimate for Face Lift Surgery at world category Hospital and Comprehensive Facilities in India. A Face Lift can improve sagging in the mid-face and deep creases below the lower eyelids, along the nose extending to the corner of the mouth. The RCC buildings theoretically have a life of around 100 years, but they don't go with the trend after a span of 12-15 years. Demolishing and building a new structure is a costly affair. DCAPL has undertaken few projects where the old buildings are standing tall in comparision of the few recently built. Facelift is a surgery in which the most visible effects of ageing are reduced.As people age, the effects of gravity, exposure to the sun, and the stresses of daily life can be seen in their faces. Deep creases form between the nose and mouth; the jawline grows slack and jowly; folds and fat deposits appear around the neck. #100% pure & Stablize aloe content. #Adaotogenic for all skint ype. # heal & nourish all skin issue. # deeply panetration ability due to aloe hilling ability. # Nourish & glow up skin from Hypodermis layer. #Zero chemical, steroid & alcohal formula. Rhytidectomy is a procedure designed to restore youthful appearance to the face and neck. As such, it will remove many wrinkles and make those remaining much less apparent. 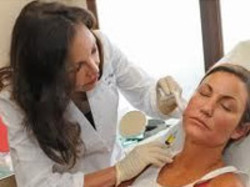 Extra skin is removed and the facial contour is transformed to that of a younger person. A face lift is generally an office procedure and is done with local or general anesthesia. Dr. Richa Jain provides Skin Anti Open Pores facial Treatment through Advance Technology. We provide all treatments in dr.
What Is Thread QueensA Surgical Procedure that Help to grow Collagen .It provide Lifting by using a specifically formulated thread which is used in heat Surgery. In this Procdure, there is no Skin incision.